BBC Four tucks away Jessica Hynes charming sitcom Up The Women! If you want one good reason to watch Up The Women then it would definitely be the brilliant cast, which includes the wonderful Jessica Hynes who has written and now stars in this charming sitcom. But actually, I can give you more than just the one reason to stick with this three-part comedy on BBC Four. It’s 1910 and we are invited to a meeting of the Banbury Intricate Craft Circle, which consists of Margaret, Helen, Eva, Myrtle, Gwen and Emily who convene regularly in Banbury Church to sew suspicious looking patterns (sorry Gwen, did you say Poenies or… actually nevermind!) and have lots of banter. Margaret (Hynes), having just returned from London, has witnessed first hand the women’s suffrage movement in all its glory and is now inspired to convince the other ladies that their group should also support the cause – she even has rosettes on hand! The episode begins with a very funny scene between forward-thinking Margaret and caretaker Frank. Frank, struggling to install a light-bulb (the church’s first electric one), doesn’t quite have the grasp on electricity that he thinks he does – this creates some amusing irony as Margaret is forced to grit her teeth and take a lesson off Frank in the science behind electricity when in fact she is much more educated on the matter, along with many other subjects. 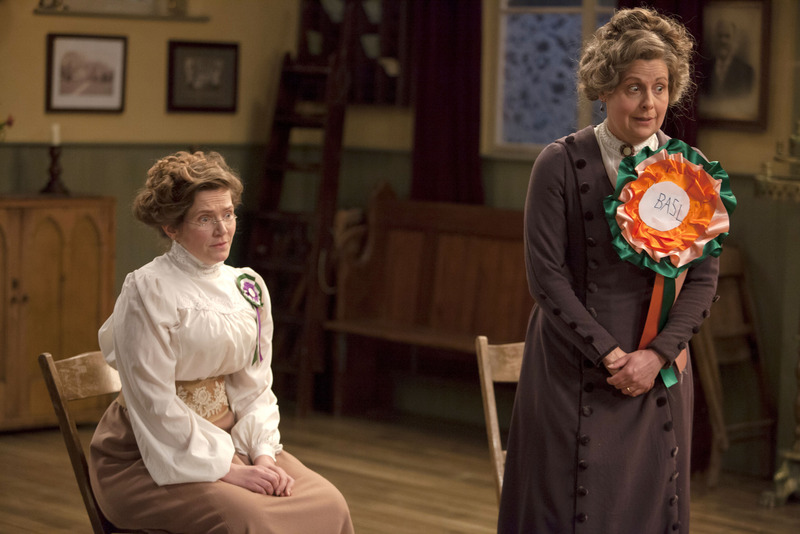 Margaret’s biggest challenge is convincing self-assured leader Helen (Rebecca Front) to support the cause but Helen is completely set in her ways and, along with electricity, thinks that votes for women is extremely unnecessary; she even quite happily tells Margaret that “My husband votes for whom I tell him to vote. What could be a better system than that?” Helen then goes as far as setting up her own anti-suffrage movement league and bribes the other ladies with much larger rosettes (11 to 12 inches to be precise) and cakes and sets up camp in the Banbury Church kitchen to oppose Margaret’s motion. Margaret and Helen eventually reach a compromise to each have their say on the matter and let the other group members decide whether they want to support the suffrage movement or not. After an enthusiastic pitch to the ladies, in which Margaret hilariously points out that medical student Thomas (who has been drafted in to help with the light-bulb) although lovely is not bright and is considered weak (similarly to how women are perceived) but is still eligible to vote, manages to win them over with her contagious enthusiasm. By the end of the episode the Banbury Craft Circle are now respectively the Banbury Craft Circle Politely Requests Women’s Suffrage. With the other fantastically funny characters, such as Helen’s stroppy daughter Emily who is unwillingly dragged into the whole debate but ultimately supports Margaret’s cause, dimwitted follower Gwen (played by Vicky Pepperdine) and loveable Eva who seems to pop out child after child, there is great contrast and dialogue between all the characters that seems to work really well. The jokes don’t feel outdated or that clichéd and although there was room for some improvement, overall this first episode was a very pleasant surprise. This cleverly written sitcom could be in danger of being overlooked and not get the attention it deserves which would be a shame as for me Up The Women was quite reminiscent of greats such as Dad’s Army and The Vicar of Dibley – However, although I found it very funny in places, it didn’t quite match up on the comedy stakes. But there are still two episodes to go, a second series on the horizon, and one thing is for sure, the Banbury Intricate Craft Circle Politely Requests Women’s Suffrage have definitely got my vote, do they have yours? Up The Women will continue next Thursday evening on BBC Four at 8:30pm.